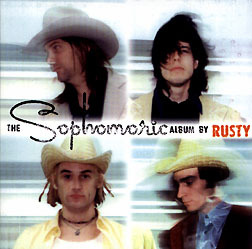 Upon first listen, I couldn't believe this was Rusty. I was ready for a heavier sound and Ken McNeil's scratchy voice escaping in volumes; but, what I heard instead was his voice singing and harmoniously presenting the words to the songs. I hated it, but put the disc on repeat for the next few days anyway. Now I like it. Present is the passion within the songs; absent is the sledgehammer angst mode that brings it to you. This album just doesn't hit you as hard. And where Fluke was written more in the second-person, Sophomoric tends towards the first-person, with Rusty seemingly delving into their own inner experiences, especially in "Walk You Home" and "Doin' Fine." Rusty are lookin' fine as well. The cowboy hats that they don on the cover aren't just a trendy fashion statement -- you can hear a bit of country lining the album. But you still hear just a little more rock 'n' roll, with songs such as "Star," "Failed" and "DS-27," the latter reminiscent of the New Bomb Turks with its fast-paced glam heaviness. Where most sophomoric efforts lay flat in attempting to emulate their predecessors, Sophomoric rather wears a confidence in its subtleties and displays a different side of a rising Canadian band.